According to Foss Patents, the recent court ordered importation and sales ban in Germany that covers the Apple iPhone 7, iPhone 7 Plus, iPhone 8 and iPhone 8 Plus is binding on Apple only. That could explain why Apple has stopped selling those models in the country's Apple Stores, and online. It also explains why a German reseller is still offering those models, as are three of the major carriers in the country. This information makes you wonder why Qualcomm even bothered to post the $1.52 billion bond required to start the ban. That money is supposed to be used to reimburse Apple for any lost sales of the affected models in the case that Apple's appeal is successful. 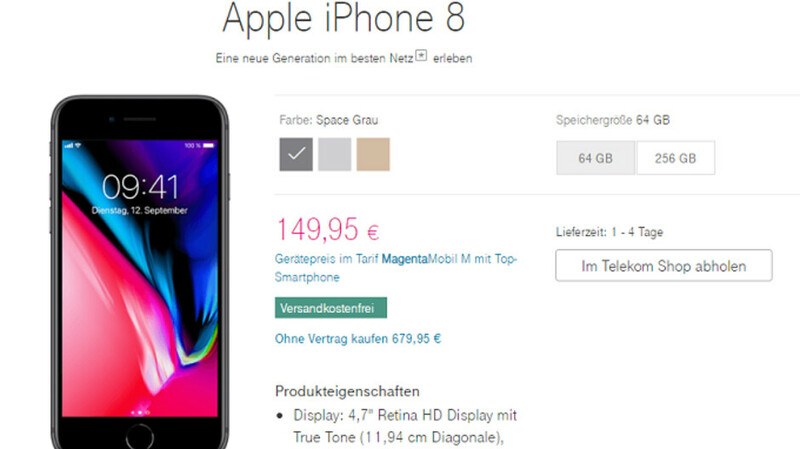 Meanwhile, in Germany it appears that the Apple iPhone 7 and iPhone 8 are still available from T-Mobile (see image at the top of this article), O2 and Vodafone. Additionally, these models are still offered by German's largest consumer electronics chain, MediaMarkt. While Apple is forced to send resellers, including the carriers, a letter recalling the iPhone models affected by the action of the Munich court, these third parties are not obligated to act. In fact, they cannot be cited for contempt by the court for not following through on the ban. Considering that only 3% of iPhone sales in Germany are rung up directly by Apple, it would appear that Qualcomm is not going to get its monies worth with this injunction. Another ruling is due soon in Germany over four Qualcomm patents related to iOS search, contacts, and shortcuts in Spotlight. However, Apple has already pushed out an update to iOS 12 that supposedly removes any Qualcomm software from its phones. Except this is nothing like that. The patents Apple allegedly infringed were acquired from a dead company. It’s likely Qualcomm bought them as last ditch leverage to protect their illegal business practices. I don’t understand why people defend Qualcomm in this, they’re increasing the cost of smartphones for everyone. It is about the lesser of two evils in this one. In the QC vs FTC battle, I would support the FTC. But in the QC vs Apple battle, the bigger of the two trolls with more small business skeletons in their closet is Apple, so F them. The parents must be valid to some extent, otherwise apple wouldn't have pushed out the update. No. In Germany patents need not be valid to get an injunction. It only takes money, since validity is a separate question. So actually, Apple's updating their software admits nothing. The ease at which the update takes off the possibility of violating patents–if the update in fact does this–just shows how frivolous is the QC action to strong-arm Apple into settling their separate case against Apple. I mean it's a bond though, so they can get it back. And whatever they can't get back is a tax write off. So QC isn't really losing money. If those are the terms then this is not a sales ban, only a technical ban.